Kit P: When authorities say a problem such as the Interlok issue is to be handled by an 'independent panel', there is a reasonable expectation that the panel will be allowed to do its job without undue interference, and its recommendations will be accepted even if Education Minister Muhyiddin Yassin may not really agree with it. Otherwise don't call it an independent panel - that amounts to a public relations fraud or a whitewash. Wira: I remember the 'Malay' entry in Encyclopaedia Britannica drew frenzied protests from the community because they were stereotyped as lazy. I don't understand why a novel published locally which insulted the sensitivity of the Indians be allowed to be used in our schools. Have our educators lost their common sense? Jimmy Ng: Muhyiddin claims that they were minor issues? Who does he think he is to decide whether they were minor? Why not leave it to the committee to iron out and decide whether they were minor or not? Who should know better how to spell correctly words on Indian ceremonial matters - non-Indians or Indians? My bet is that he is putting political considerations first and foremost above other things. Gerard Samuel Vijayan: The solution is very simple - withdraw 'Interlok' and replace it with another text by some other Malay writer. Why can't it be done? What is wrong with amending minor words and phrases since the entire book is under review? If there are spelling mistakes, grammatical and contextual errors, shouldn't these be corrected? Or is the review only confined to the word 'pariah'? 'Interlok' is not a suitable book to be made compulsory reading in schools. It contains many factual and cultural errors, racial profiling and stereotypes, and derogatory terms to refer to Indians and Chinese and even the Malays. So why keep such a controversial and divisive book as a compulsory text? Teacher: I agree. It is a good novel but it is not suitable for schools. Will the teacher who has to teach it be able to handle it with all the negative publicity it has received? Students will tease each other and this will not create unity in class. It may be a cause for a fight outside the class. Please withdraw the book. Don't create more problems for teachers. 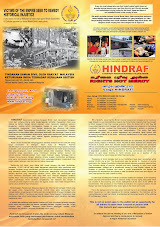 53 Hindraf M.S. prosecuted: Urgent appeal for contributions for bail! Quote from Malaysiakini of 17th March 2011, ”Denying that he had rejected the 100 amendments to the novel suggested by the committee, Muhyiddin claimed that he had in fact called for a review of the amendments as he believed that they were "minute" issues which ran away from the "isu pokok (main concern)". Muhyiddin is proving to be a clown the way he is dealing with the Interlok novel issue He sets up an independent panel to review and suggest changes to the Interlok novel. Then he just about overrules all their suggestion. This results in a disgusted walkout by the Indian panel members. Then he denies rejecting the 100 suggested amendments saying what he looking for was more substantial than the nitpicking the panel had done. Is he not a clown. That substantial thing he is looking for is a withdrawal the book altogether from the curriculum – is right there in front of his eyes. A child could come up with that. He chooses to nit pick instead and thenturns around and accuses the review panel of nitpicking. He is a natural joker isn’t he. A clown. That is how he so easily appears to us. The whole UMNO government is proving to be a failure over and over again over all the contentious issues they have to deal with in running the country. One of the manifestation of this failure is the increasing polarization among the people in the country. The elite within UMNO in their selfish desire to keep a tight handle on the controls of the resources of the country need the Malay Muslim vote. They play up issues like Interlok, saying the minorities are being unreasonable and demanding in spite of the good nature of the Tuans. The book authored by a National Laureate and celebrated Malay writer can do no wrong. It is the minorities who are becoming demanding encouraged by the fact that the Malay people are split. So, the argument goes. The only way we can keep the minorities in their place is for the Malays to unite. This logic repeated over and over again by Perkasa outside and by the various internal propaganda organs inside UMNO is enough to make the ordinary average Malay citizen become a victim to this lie. The elite within UMNO are enjoying the security of the false race consciousness among the Malay people, oblivious or careless about the net effect on the nation as a whole. This path only takes them further down, as the Malay citizens who buy this lie will then extend the race logic in their little realms all over the country as you see increasingly happening now . As time passes , the trajectory for racism in the country moves further and further upwards. What has been subtly happening for 54 years now bursts out into the open and operates openly, no need for the subtlety of the past. It becomes aggressive racism. This is a new reality emerging in the country. Why are all the villains and nasty characters in Interlok Chinese and Indians? As the drama over the Interlok textbook issue continues to unfold, it is important for Malaysians to understand the context and the stakes involved, and to make a stand. There are some defenders of the book who have argued that withdrawing or even just editing it will rob Malaysian writers of their artistic freedom and integrity. To these people, I would like to say “hello, where have you been” – Interlok has already been edited twice, in 2005 for Edisi Pelajar and in 2010 for Edisi Murid. Its literary integrity was already compromised by the shedding of some 85 pages even before this latest controversy. In fact, copyright for the edition distributed free to schools no longer belongs even to Abdullah Hussain but to Dewan Bahasa dan Pustaka. Hence Education Minister Muhyiddin Yassin’s statement that his ministry “will ensure that any amendments made will not affect the storyline of the novel and the noble message that the author wants to convey” is nothing short of whitewash. According to reports, Muhyiddin is not permitting anything beyond deletion of the word ‘pariah’. This concession is like slicing off one tentacle from a hundred-headed hydra – a totally pointless exercise. Make no mistake; Interlok is a work that must not be permitted into the nation’s class rooms as a compulsory literature text. Anything less is a vital failure to grasp the gravity of the threat it poses. The quarrel is not merely with vocabulary or spelling (for example, of ‘tali’ vs ‘thali’) but the overall suitability of the novel with its overt and covert racial messages as a school text. Concern by many Malaysians that Interlok has been intentionally selected by the authorities to fulfill the Umno/Biro Tata Negara objective of indoctrinating young minds with a warped worldview and national view is hardly misplaced. Before these concerns are dismissed as imaginary or overwrought, let us not forget that education has long been and continues to be the most politicized sector of the country. Far from being neutral institutions, many of our public sector colleges and universities consciously and consistently promote a narrow nationalism. It is in the educational sector where proponents of the Ketuanan Melayu dogma have sought to impose their will and polarize our communities. Their missionary zeal focuses on use of race-based criteria at all levels and in all aspects. It is no surprise therefore that the propagation of the ideology of super-ordination and subordination has now been extended to the schools, and to the curriculum and text books. As has been pointed out by those who have analysed the Interlok content, why are all the villains and nasty characters Chinese and Indians? One of the key plots turns on the rapacious Chinese merchant swindling the easily duped Malay of his inheritance. Touted as a ‘historical novel’, Interlok is constructing a version of BTN history and racial stereotypes to influence young minds. Its government-mandated and authorities-supported dissemination and circulation appears to further a carefully thought-out agenda to fan racial animosity. Because Interlok is the first round battle (in tandem with the History curriculum revamp), it is important for conscientious objectors to send a strong signal to the Education Minister and his bureaucratic and academic cronies that Malaysians will not be cowed into acquiescence. We must exercise our right to openly discuss, criticize and protest on this crucial matter. To remain mute will only embolden the apologist wolves wrapped in their sheep clothing of educational good intention and defence of literary freedom. Photos : HRP VP K. Tamil Selvam’s house burnt down by Police Special Branch under Ops Padam Hindraf. In a collective stand, Pakatan MPs call for the revocation of the controversial book and for Najib to replace his deputy in the deliberation process. KUALA LUMPUR: Pakatan Rakyat MPs today made a collective stand, calling for the immediate withdrawal of the Interlok novel. They also wanted Deputy Prime Minister Muhyiddin Yassin to be removed from the deliberation process based on the three Indian representatives quitting the independent panel, tasked with amending the book. “Muhyiddin should be taken out and (Prime Minister) Najib (Tun Razak) should replace him,” DAP MP Charles Santiago told reporters in Parliament. Johari also took a swipe at the government’s decision to edit the book after a firestorm of protest, especially from the Indian community. The book, penned by national laureate Abdullah Hussain, courted controversy when it was introduced as a component for the Malay literature subject for Form Five students this year. “This is the work of a national laureate, how are you going to edit the gist of the work (without violating the author’s right)?” asked the PKR MP. DAP’s Teluk Intan MP M Manogaran said the matter must be resolved quickly as the students would sit for their SPM examination in November. He urged the government to apologise and immediately retract the book from the syllabus. The press conference was also attended by MP Dzulkefly Ahmad (PAS-Kuala Selangor), M Kulasegaran (DAP-Ipoh Barat) and R Sivarasa (PKR-Subang). The three panellists had walked out complaining that 100 suggested amendments were shot down, but Muhyiddin, who is also education minister, said this was because it concerned “minute” details.